I intended to share this with you on Monday, but I got knocked flat by a nasty bug that my husband tried REALLY hard not to share with me. I’m finally vertical again, but the sooner this cough goes away the better. 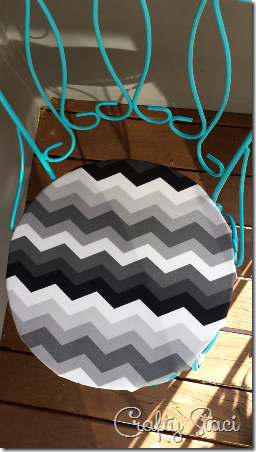 Enough of my sickly whining, I want to show you a quick way to cover round chair cushions. With the holidays upon us, doesn’t it seem like you’re always looking for an extra chair for company? You can easily recover round patio chair cushions to fit in better with your indoor Thanksgiving or Christmas décor! To create your pattern, measure the diameter of your cushion, add the height, then add 1”. Cut a piece of string 3 or 4 inches longer than the number you just came up with. Tie one end of the string around a pencil. I found it helpful to use a pencil with a cushion on it so the string wouldn’t slide around. Tie a knot in the other end at the distance from the pencil that matches your number. Fold a large piece of paper in quarters. Stick a pin through the knot on the string into the tip of the folds. 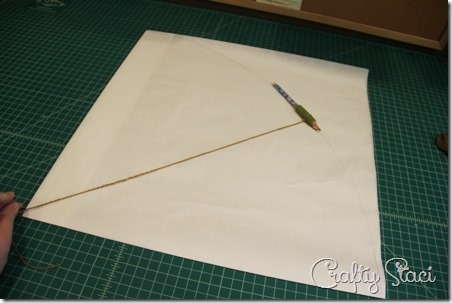 Draw a curved line with the pencil by stretching the string as far as it will go. Cut along that line. Unfold your pattern and pin it to the fabric. I was making two, so I doubled my fabric to cut them both at once. Sew a buttonhole starting 1 1/8” from the edge. Fold the fabric in 1” and stitch near the edge. I didn’t fold the edge under because it will be on the inside, but if you’re worried about it fraying you can fold the edge under 1/4” before stitching. Tie a knot in a piece of cord and attach a safety pin. Feed it through the buttonhole, around the circle through the casing and back out the buttonhole. I cut a smaller circle and laid it in the center so none of the bare cushion would show. You don’t necessarily need to do this, especially if your cover is temporary. Lay the cushion in the center of the cover. Pull the cord to gather, then tie a bow. You can either tuck the extra cord inside or cut it off. I’d recommend tucking it so it can be reused. Wouldn’t it be cute to make these with holiday fabrics? This set lives on my daughter’s apartment deck now – maybe she needs Christmas chairs!